There’s a good reason why some websites (mine included) feature so many client testimonials. They build belief and credibility like no other copy element can. In fact, these days, prospects get suspicious if your website doesn’t feature clients or customers saying great things about your products and services. But there’s a problem with testimonials. According to eye path analysis—a method of studying where eye balls linger on a web page—people tend to look at testimonials rather than read them. 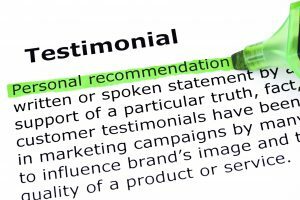 So a client may have given you a glowing endorsement, but beyond the fact that the testimonial is there and gets noticed, the message itself may not be getting through. I found this recently when I was shopping for a web designer. I visited one site and was knocked out by all the testimonials that designer had—some from professionals I recognize and respect. The thing is, I didn’t actually read any. I simply looked at all the testimonials and said wow. 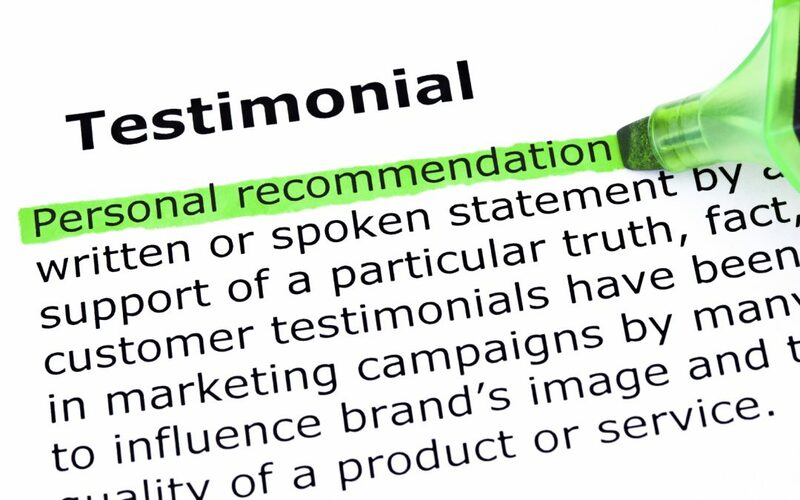 Obviously, you want your testimonials to get read as well as noticed, because if you do your marketing copy will be that much more persuasive. So how do you do that? Give them headlines. It may seem strange to add a headline to a testimonial, but try it. It can work well. The way I do it is by pulling a key statement from the testimonial and then creating a headline around it. A headline for a testimonial raving about a training program might be: Hard to Impress Sales Team Gives it 5 Stars. Even if prospects don’t read the actual testimonial, they’ll likely notice the headline and get the key message. Bold key sections. 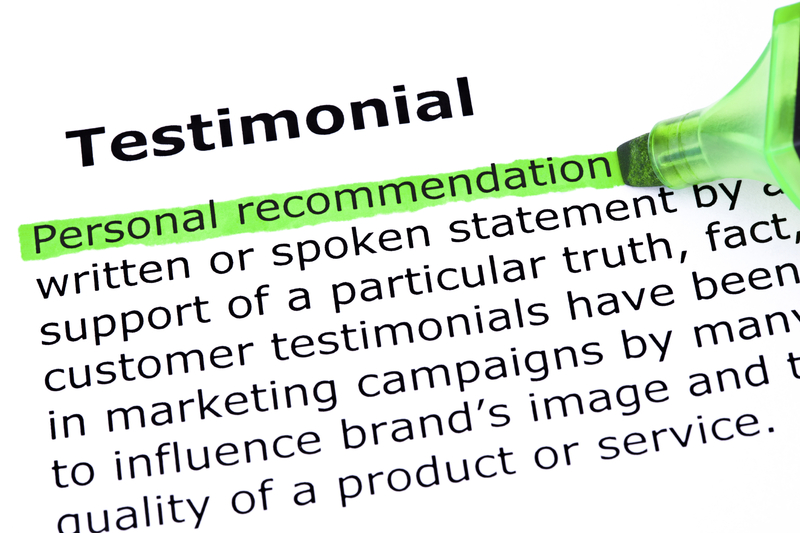 Another way to draw attention to a specific point made in a testimonial is to bold it. I find bolds work better for testimonials than italics. (That might be because many testimonials are already italicized.) Just don’t get carried away and attempt to emphasize too much. Limit bolding to one statement or sentence. Transform them into success stories. If you have a detailed testimonial from a particularly happy client, why not turn that into a success story? Just provide a bit of commentary on the work you did for the client along with the original testimonial. Voila! You now have a short, engaging success story. And I find these tend to get read more often than testimonials. Testimonials are hard to come by and highly persuasive. So it makes sense to leverage them to the hilt. Hopefully, these tips will help you do just that. Thanks for these tips, Steve! I’ll definitely be using them as I create my freelance website in the near future. Good luck with the website, Sharon! Let me know when it’s online. But! Your testimonials, which I’m seeing along the right-hand side of THIS page, as I type, don’t follow your advice!! My current site doesn’t have testimonial headlines. But my NEW website, which will be online in two weeks (fingers crossed) definitely will. Great topic and great insight as always Steve. Now I just have find the time to “embolden” my testimonials . . .
You sure know your typographic terminology! Thanks Ryan. Great stuff – but there is a fly in the proverbial ointment: Google. I had all these points on my landing page, but Google suspended my PPC ads until I took them off. Why? They were “too effusive” according to their account rep. No amount of logic would work with them. It didn’t matter if they were totally, 100% on the up and up. It was their way or the highway. So now they are relegated to an ancillary page. It’s hard to argue with an 800 lb. Silverback. Hi Jack. Thanks for that information on Google. I can’t imagine why they’d object to a headline for a testimonial (which I assume is what they’re objecting to.) Do you have a link to Google’s guidelines on this? I’d really appreciate it. The rep said a prospect could get a false expectation about the effectiveness of my copywriting. So it wasn’t just the testimonial headline, it was the entire testimonial. They also sent me a warning email right before Christmas – shortly before 10PM! Two hours later, the PPC ads went silent. Talk about giving me reasonable notice and a chance to comply! They must have had the Grinch as a mentor. Great ideas Steve! I’m going to try adding a mini-headline to my testimonials. It sounds like Jack had some problems with Google and doing that, however I do not use PPC ads. Nor do I solely depend on SEO traffic to get people to my site. I’m promoting it via cold calls and direct mail. So even if Google says it’s bad form, I want them to be read when people come to my site! Did not know that about testimonials. I will keep your tips in mind as I build my site. Thank you.